The VeloPlus wheelchair transport bike designed to transport people, who remain seated in their own wheelchair, by cycle. 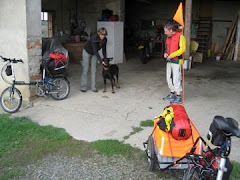 E-transport bike for children or of course for large dogs. The company offers both bicycle/tricycle hire and touring holidays based in a hotel in Straubing with wheelchair access. 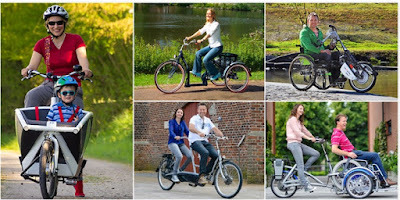 The websites are in German: e-bike-verleih-bogen.de (Hire) and e-bike-radtouren.de (Holiday) but offer photographs of the various bikes/trikes on offer. There is always Google Translator, of course. If you are interested in hiring a bike or two and don't speak or write German just send the company an email in English. In our experience German companies always have somebody on their staff who understands English.